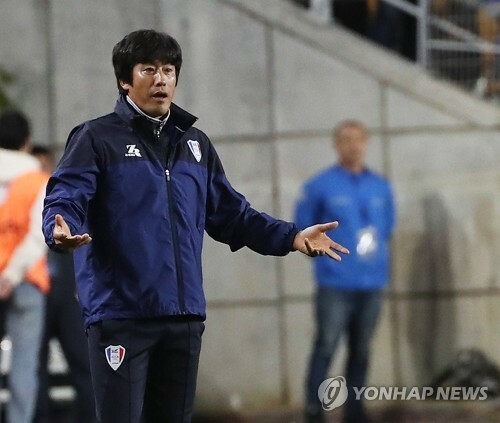 SUWON, South Korea, Oct. 24 (Yonhap) — Suwon Samsung Bluewings head coach, Seo Jung-won, lamented his side’s lack of concentration in the late second half of the team’s defeat in the semi-finals of the premier Asian club football tournament. Suwon failed to reach the final of Asian Football Confederation Champions League (ACL) after losing to Japanese side Kashima Antlers 6-5 on aggregate. Suwon were held to a 3-3 draw by Kashima in the second leg of the ACL semifinal match at Suwon World Cup Stadium in Suwon, south of Seoul. The result means Suwon are out of the tournament as they had dropped the first leg 3-2. Suwon were looking to make their first ACL final appearance. The K League 1 side twice won the Asian Club Championship, the predecessor of the ACL, but have not played in the final of the continental tournament since 2002. Seo’s side had a difficult start at home after they conceded the first goal to Kashima’s Shuto Yamamoto on a set piece in the 25th minute. Suwon then made a dramatic change in the second half, scoring three goals in an eight-minute span. Starting from 52nd, Lim Sang-hyub, Jo Sung-jin and Dejan Damjanovic scored apiece to take the lead. But Kashima cut the deficit to one after Daigo Nishi found the net in the 64th. Kashima’s Brazilian attacking midfielder Serginho then scored a precious equalizer for the J. League side in the 82nd. It was a similar situation that Suwon fans saw in the first leg. The four-time K League champions blew a two-goal lead in the opening leg in Japan.